Awhile back I posted about this awesome orange gourd lamp I ordered from CSN with a giveaway I won from Sissy over at Blue Hydrangea. I was so excited to get the lamp and put it next to my bed so I could see it every evening and morning. BUT- when I got the package in the mail it was smashed to pieces- big sad face. I ordered it from the CSN clearance center for a great price, so I knew ordering a brand new one at full price was not an option. 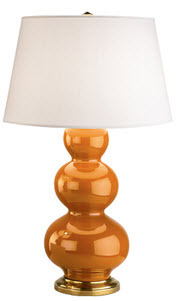 That was until, I saw another gourd lamp pop up in the clearance section! This time it came intact! Thank you (again) Sissy for my beautiful new blue lamp! love the blue and that it arrived in one piece. Not only is that a beautiful color blue I but the shape is amazing. Like. Oh, I love it! It is the most perfect shade of blue. Love it!! 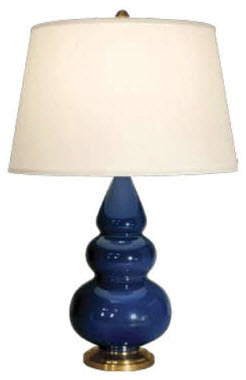 And, what a great tip - I had no idea they had a clearance section - so many beautiful Robert Abbey lamps at good prices. Thanks! ohhh bedside table is looking GOOD!